Dr. Lucía F. Zacchi is a yeast genetic engineer and molecular biologist, specialized in protein quality control and glycobiology. She graduated as Microbiologist from Universidad Nacional de Río Cuarto, Argentina. She then obtained a Fulbright Scholarship to pursue her Ph.D. in Microbiology, Immunology, and Cancer Biology at the University of Minnesota, USA. For her dissertation she studied mechanisms of phenotypic variation in the pathogenic yeast Candida albicans. She did post-doctoral work in the laboratories of Dr. Jeffrey Brodsky (University of Pittsburgh, USA), Dr. Julio Caramelo (Fundacion Instituto Leloir, Argentina), and Dr. Benjamin L. Schulz (SCMB, UQ). Dr. Zacchi has been the recipient of Post-doctoral Fellowships from the Dystonia Medical Research Foundation, CONICET-Argentina, and Endeavour-Australia. In her work, Dr. Zacchi aims to dissect the molecular machinery involved in the secretory pathway and how to manipulate it for medical and biotechnological applications. She uses the model yeast Saccharomyces cerevisiae (Baker's yeast) and mammalian cells to study mechanisms of protein glycosylation, protein quality control, and protein degradation in the cell, under physiological conditions or during disease. 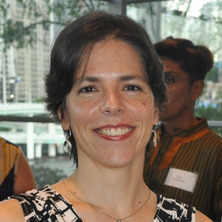 Her research employs a variety of techniques, including genetics, molecular and cellular biology, and proteomics and she develops new molecular tools, genetic screens, and glycoproteomic workflows. Her current research is specifically focused on glycoengineering of eukaryotic cells and bioprocesses to develop and optimise the production of specific glycosylated variants of biotherapeutics of interest. 1) Protein folding in the cell and glycobiology. 2) Glycoengineering of cell lines and bioprocesses. 3) Mechanisms of fungal pathogenesis. The understanding of the processes involved in protein quality control, folding, and glycosylation reaches fields as diverse as microbial pathogenesis and human genetic diseases, and has important biotechnological, clinical, and industrial applications. Journal Article: N-glycoprotein macroheterogeneity: biological implications and proteomic characterization. Yeasts, glycoproteomics, microbial pathogenesis, neurological diseases, biopharmaceuticals... take your pick! We are always looking for enthusiastic, team-oriented, and fast-learning students with a background in Biochemistry, Molecular Biology, Microbiology or related fields, and an interest in learning molecular and cellular biology, glycobiology, models of disease, and/or proteomics. Previous experience in a molecular biology laboratory is required (we may request a reference letter). IMPORTANT: Please note that if you intend to do a Master's or a PhD you will need to have your own scholarship/fellowship. Our goal is to provide you with the best experience, both inside and outside the lab, which will contribute to train you for a career in research. An integral part of the experience in our lab will involve active participation in lab meetings and journal club discussions. We will encourage you to present your findings to the group. We will also endeavour to coach you in effective presentation techniques, scientific writing, ethics in research, good laboratory practices, and team-work. We have plenty of projects available. Contact us! N-glycoprotein macroheterogeneity: biological implications and proteomic characterization. Zacchi, L.F., Caramelo, J.J., McCracken, A.A. and Brodsky, J.L. (2016). Endoplasmic reticulum-associated degradation and protein quality control. In Ralph A. Bradshaw and Philip D. Stahl (Ed. ), Encyclopedia of cell biology (pp. 596-611) Waltham, MA, United States: Academic Press.